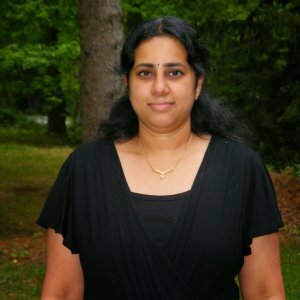 This week I am doing dishes that are commonly found in a South Indian Meals. 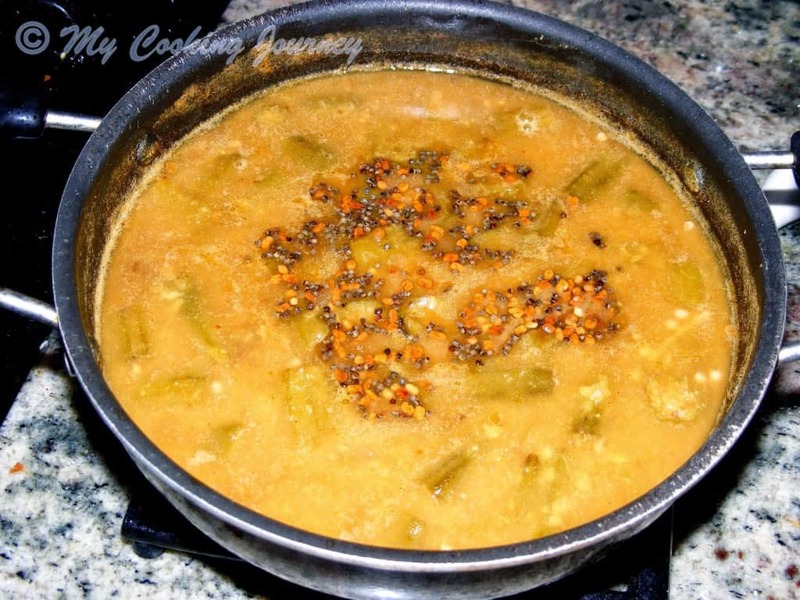 Sambhar is usually the first course dish that is eaten with rice. 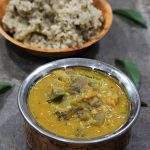 Sambhar is common in almost all the South Indian states, but they are called by different names and differ slightly in flavors based on the region. 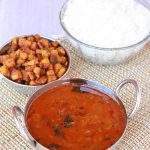 Sambhar is also something that is served with tiffin items like idli, dosai, upma and pongal. 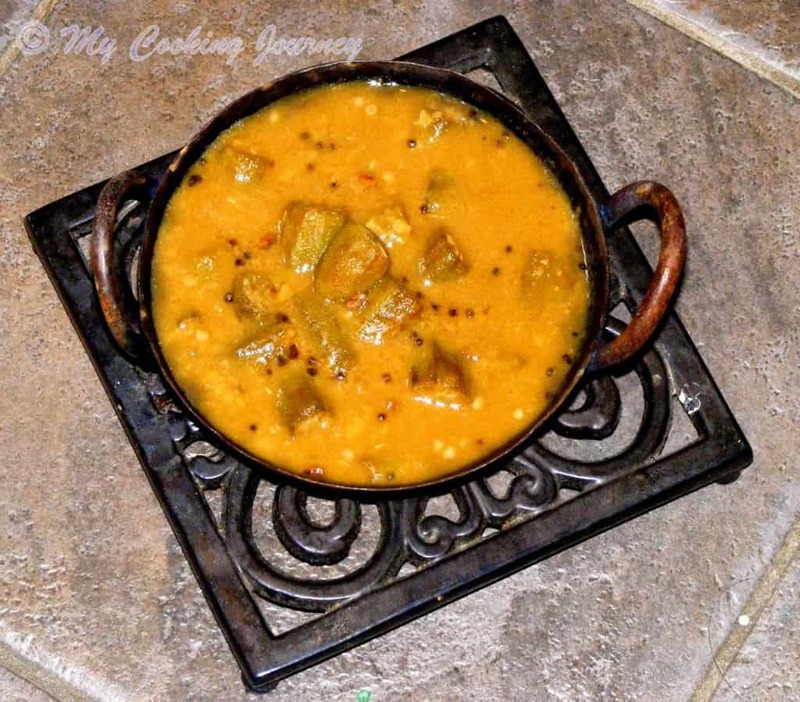 My family loves okra (ladies finger) and I make it quite often. 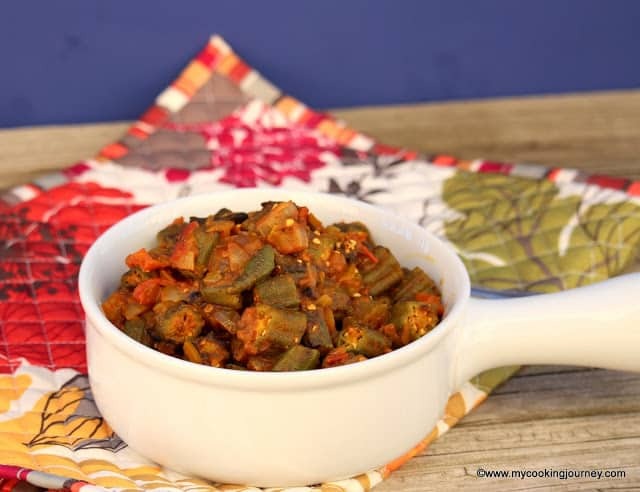 In summer months especially when my backyard is bursting with okras I use them in many different recipes. What dish I make depends on how much okra I harvest. 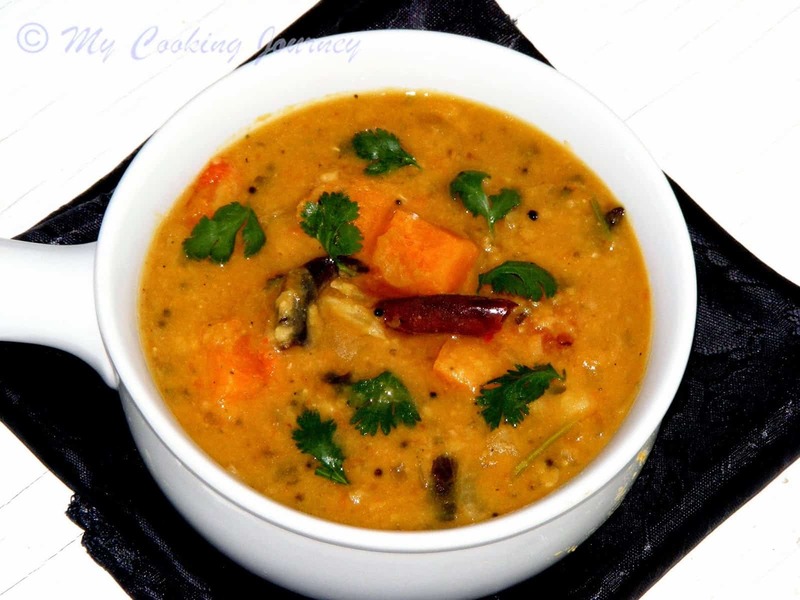 If the quantity is less then I make it as sambhar or make vendakkai pachadi/raita. 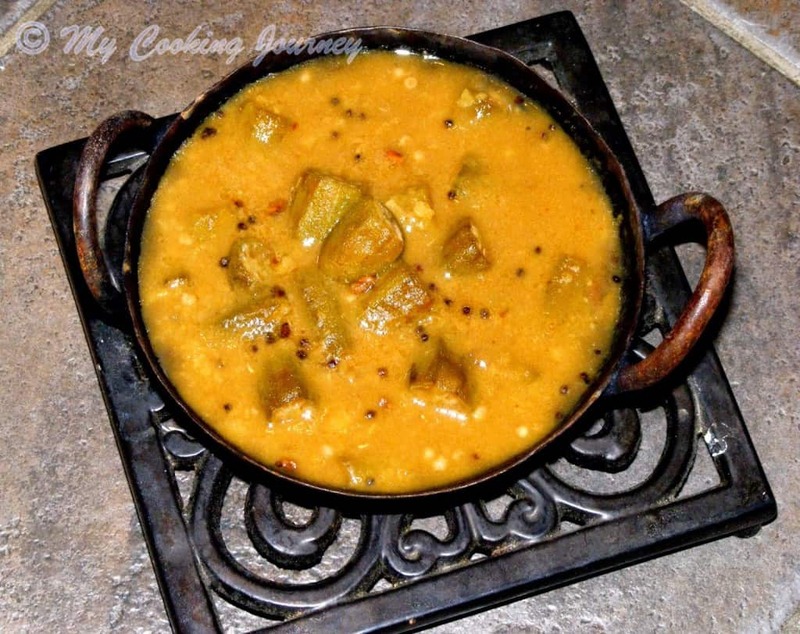 If I harvest a large quantity of okra, then I make vendakkai curry. 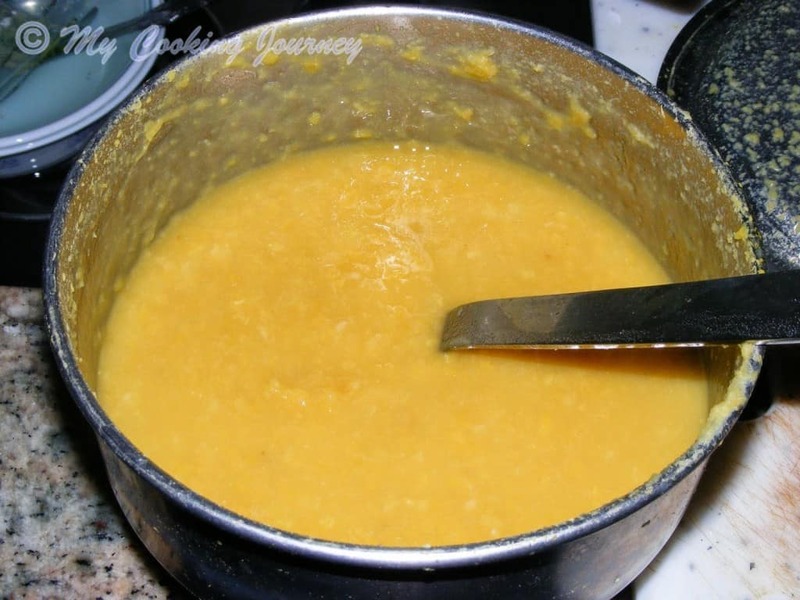 Cook the tuvaram paruppu in pressure cooker until soft and mushy. Mash it well and keep it aside. 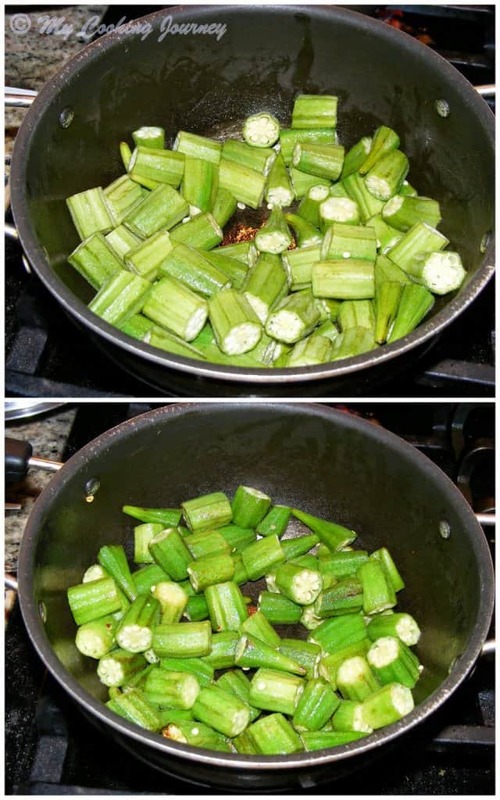 Chop the okras into 1 inch piece and keep it ready. Soak the tamarind in about a cup of water for few minutes and then squeeze out the pulp. 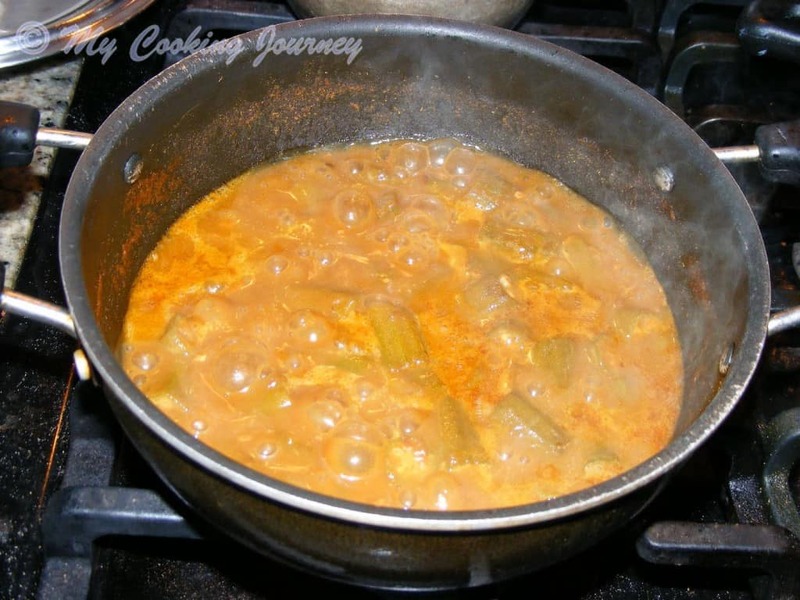 Add about 1 more cup of water and then squeeze the tamarind again. 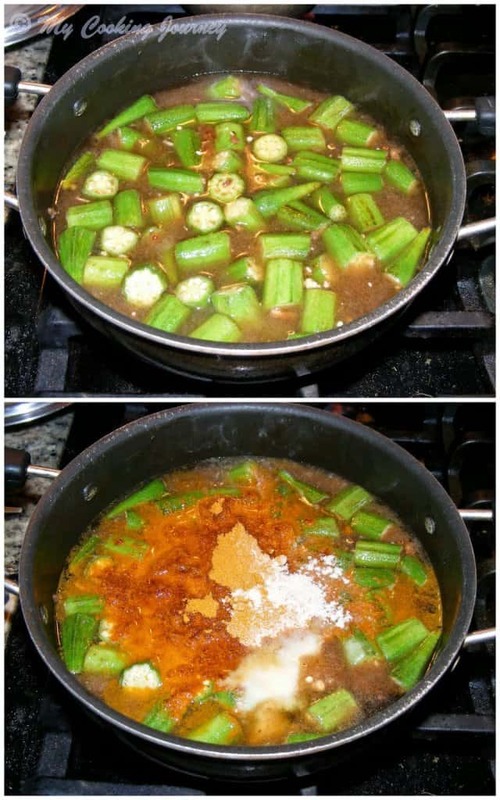 In a medium sauce pan, heat about a tsp of oil and then sauté the okra until slightly golden. 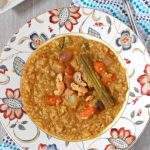 This step helps to bring out more flavors from the vendakkai. 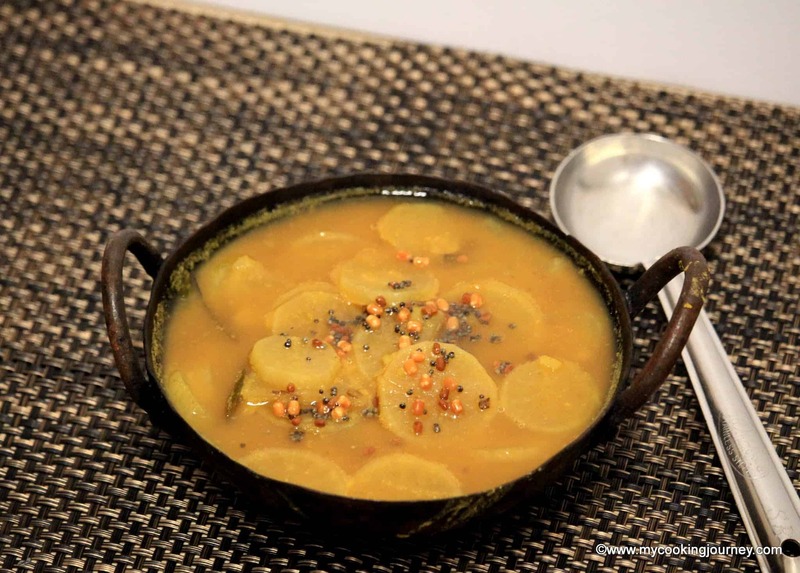 Now add the squeezed tamarind water to the vegetable and then add the sambhar powder, asafetida and salt. 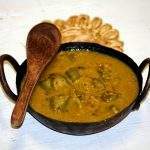 Let the tamarind water boil until the vegetable cooks and the raw smell disappears. 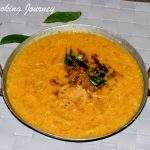 Now add the cooked dal/paruppu and mix well. 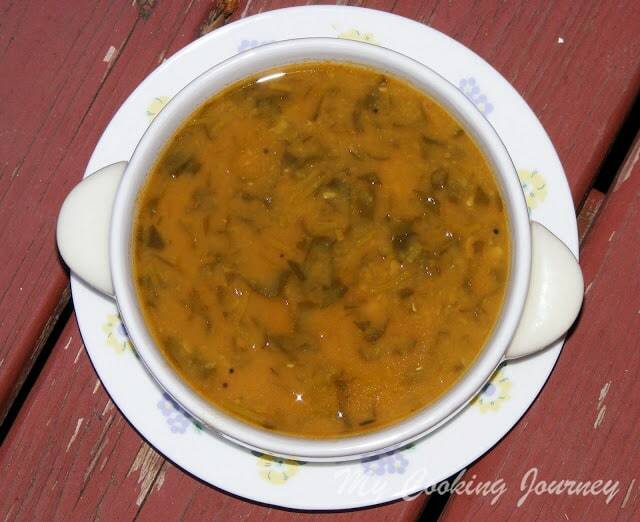 Add about a cup more of water to adjust the consistency of the sambhar. 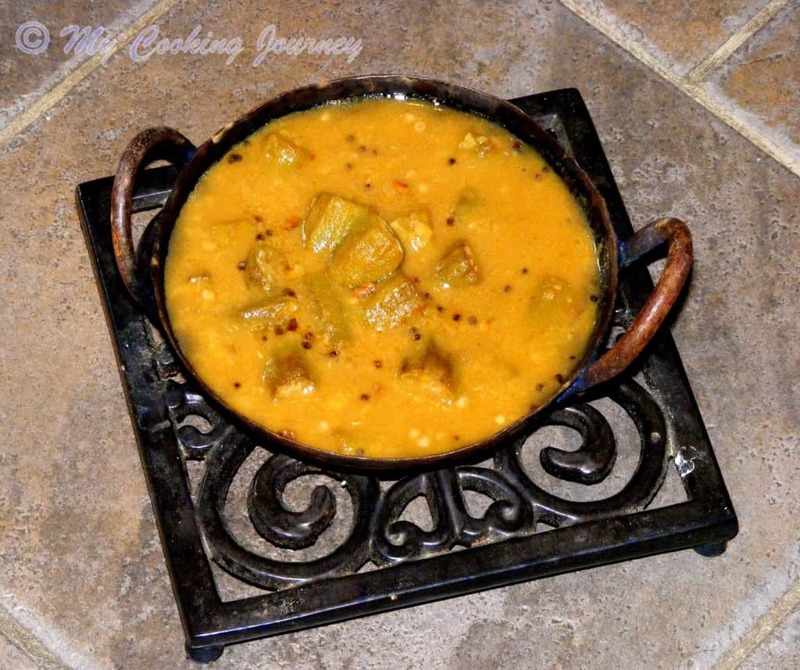 Let the sambhar come to a boil and then simmer for about 10 minutes. 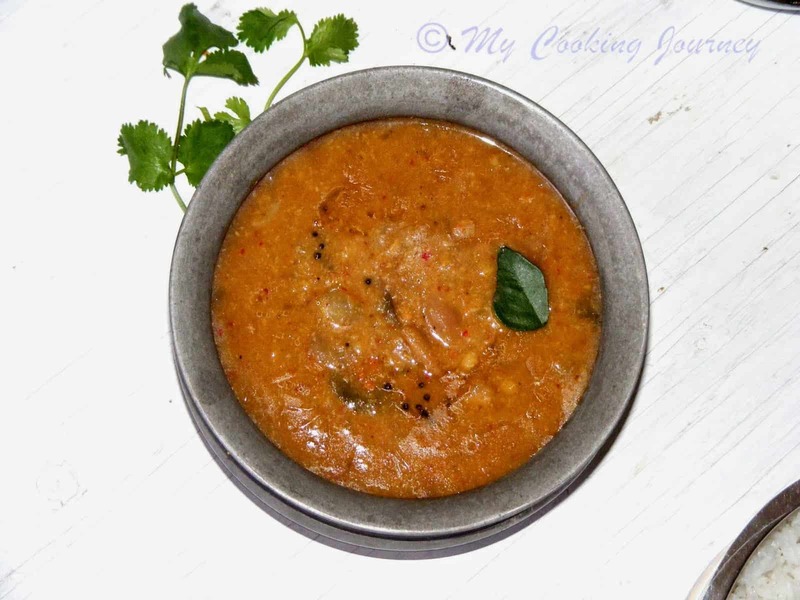 Fry all the ingredients mentioned under the seasoning and add it to the sambhar.